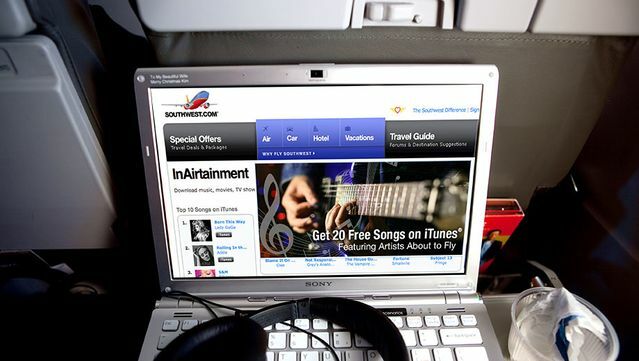 February 2011 | Southwest Airlines has partnered with Apple to create an entertainment download store called InAirtainment. To be used in the air or on the ground, the service takes the form of a website through which people can browse for music, movies or TV shows hosted on iTunes. Southwest says is it is receiving a small royalty from each download, which may be 5 percent if the airline is enrolled in the normal iTunes affiliate program. To promote InAirtainment, Southwest currently offers a playlist of 20 free songs from acts “about to fly” in their careers. The option to access iTunes for free on Southwest flights may be a sign of new in-flight entertainment options to come. For example, in-flight Wi-Fi provider Aircell last year announced plans for an in-flight video downloading service, called Gogo Video. This service would give passengers on Gogo-equipped aircraft (which number nearly 1,100 in North America) the ability to download movie and television content from an onboard server to their laptops via a portal similar to iTunes. According to in-flight entertainment expert Mary Kirby, Gogo however has delayed the introduction of the video service in order to further perfect it. Southwest Airlines currently offers Row 44’s satellite-based Wi-Fi internet onboard 65 aircraft for an introductory price of USD 5, with installation on the airline’s 540-strong fleet to be completed by 2013. Passengers on Southwest can also use the onboard connectivity to get access to an in-flight wireless portal at no charge that houses limited content, including a flight tracker, shopping (Skymall, HSN), games, plus access to the southwest.com website.